Lively, friendly, growing town centre church with 110 members. The all age congregation meets for contemporary worship with music led by our worship group on Sunday mornings and also has a more traditional Sunday evening service. 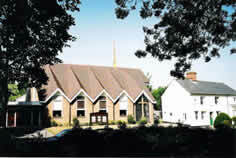 Haverhill Methodist Church, 28 Camps Road, Haverhill, Suffolk, CB9 8HF. Parking on-site. Times of service: Sundays 10.30am (and 6.30pm on 1st,3rd & 5th Sunday) Sunday Club activities for children across three age groups. Creche available. Sunday evening 'Illuminate' group for young people of secondary school age, meets weekly 6.30pm-8pm in the church hall. Refreshments served in the church hall after Sunday morning worship. Bring and Share lunch held after morning worship on the 1st Sunday of every month. ‘Next Door’ Coffee Shop and Christian Bookshop. Adjacent to the church and open for drinks, cakes and light lunches from 10.30am-1pm Monday-Saturday. 2nd Wednesday of each month - 7.30pm 'Lantern' Group for people of all abilities, carers and their families, meets in the church hall for worship, learning, sharing, friendship and refreshments. This Church is in the Haverhill Circuit. It is the only Church in the Circuit. Haverhill Church has its own website here. A list of all the churches in The Haverhill Circuit can be found lower down this page.